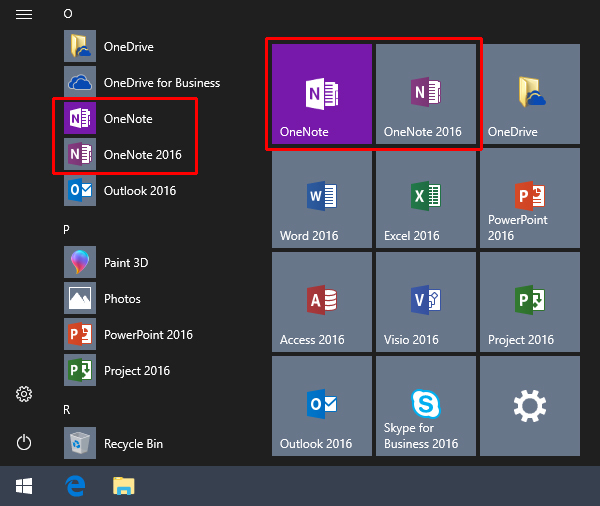 What's the difference between OneNote and OneNote 2016? OneNote for Windows 10 (simply labeled “OneNote”) is the best and most up-to-date version of OneNote on Windows. It was designed to feel natural with any input method — from mouse and keyboard to pen and touch — and it contains numerous improvements for better performance, battery life, and reliability. 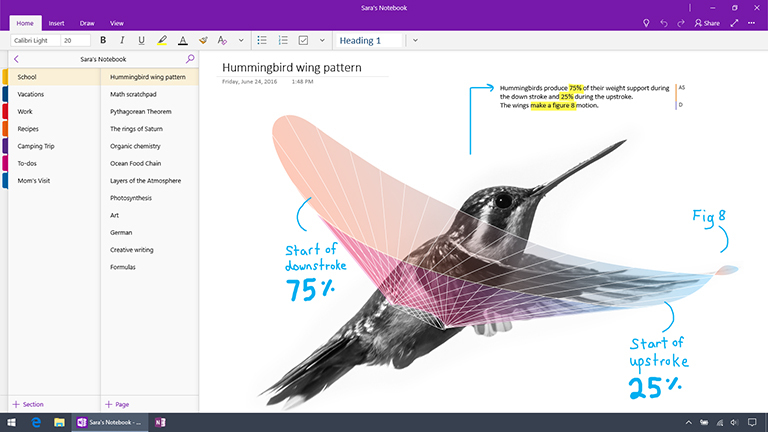 OneNote for Windows 10 also has a number of features that are not available in OneNote 2016 — including ink effects with a dramatically improved ink-to-text option, Researcher, a notification center, deep integration with Windows 10, and much more. OneNote for Windows 10 comes pre-installed on every version of Windows 10, and it’s included in Office 365 and Office 2019. By comparison, OneNote 2016 is the original Windows version of OneNote, which came with Office 2016 and earlier. It has some legacy functionality that might be important if you use this version at work or school, but OneNote 2016 is no longer being updated with new features. OneNote for Windows 10 is used by millions of people across the globe. It is regularly updated with the newest functionality, security, and Accessibility improvements, and it’s the only Windows version of OneNote that offers our customizable new interface that’s now consistent with OneNote for Mac, iOS (iPhone and iPad), Android (phones and tablets) and OneNote Online (the Web version of OneNote) for a truly universal user experience. While we’d love for you to start using OneNote for Windows 10 today, we know some of you might not be ready yet. Maybe your work or school relies on a feature that isn’t yet supported on Windows 10, or you don’t want to store your notebooks in the cloud. If so, you’re more than welcome to continue using OneNote 2016, but please note that it is no longer being updated with new features. OneNote for Windows 10 comes included with every edition of Windows 10, as well as Office 365 and Office 2019. However, OneNote 2016 is still optionally available for those who need it, and it can be used side-by-side with the newer Windows 10 app. If you’re on Windows 10 and have Office 2016 or earlier, there’s a good chance you have both versions of OneNote installed on your computer. You can designate either version to be your default app for opening OneNote links and files. Learn how to change the default version of OneNote. You can also choose to pin either (or both) app icons to the Windows taskbar and Start menu by following the steps below. The OneNote (for Windows 10) app icon is already pinned to the Windows 10 Start menu by default. Type onenote, right-click the OneNote (for Windows 10) app icon when it appears in the search results list, and then click Pin to taskbar. Note: If you right-click the OneNote icon in the alphabetical list of your installed apps instead of the search results list, you may need to first click More before clicking Pin to taskbar. Tip: For a chronological list of monthly feature additions and improvements, see What’s new in OneNote for Windows 10. OneNote for Windows 10 is regularly updated, which means you can expect to see new and improved features every month. To see what’s recently been added and improved, see What’s new in OneNote for Windows 10. OneNote 2016 is no longer being updated with new features﻿. We will continue supporting the app with important bug fixes and security updates through the end of support for Office 2016, which runs until October 2020 for mainstream support and October 2025 for extended support. Got a favorite feature in OneNote 2016 that you’d like to see in OneNote for Windows 10? Let us know on OneNote UserVoice. We’re constantly improving the Windows 10 app and your feedback helps to influence what we’re working on next.